Art is my passion and I have been making art all my life. 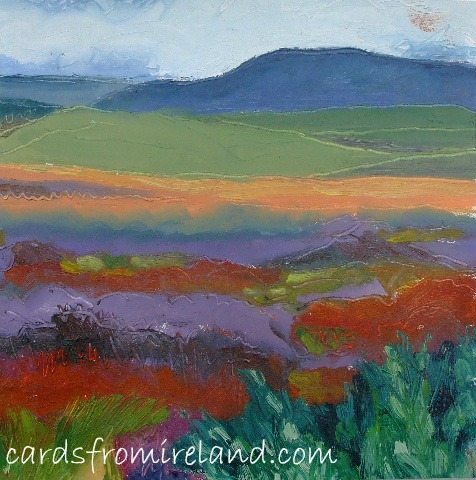 The quality of light and the ever changing colours brought me to paint in the West of Ireland. So in 2001, I moved from the UK to County Mayo after obtaining a B.A. Hons in Fine Art. A friend suggested I share my art work with a wider audience by making greeting cards and so for a fraction of the cost of a painting you can have one of my cards or prints to frame for yourself or send as a gift. I live and work in the Ox mountains in north Mayo and my studio overlooks a beautiful river valley giving me constant inspiration. Gardening is another passion, particularly flowers and painting them is a natural progression. I love the intensity of colour and texture as each one vies for my attention. I am kept busy extending my present ranges and creating new ones from current art work and adding prints to my range of products.